The seasons are changing at full throttle now. Where a few short weeks ago there were green leaves, mild breezes and endless daylight, now there are rapidly-baring branches, icy winds and encroaching darkness. Everywhere I go I have to remember my rain protection and high-collared coat, and every night I come home craving big plates of hearty, calorie-rich food. Although you’d think this should be enough to convince me that we’re spinning headlong into winter, in reality my seasonal clock is much more specific than that. While other people flip the calendar, break out the long johns and park the ice-scraper in the car, I wait for my one failsafe sign that cold weather has arrived for good. For me all the woolen mittens and frozen noses in the world signal the time of year less than a sudden, unignorable, bottom-of-the-belly craving for hot chocolate. I have always been a sucker for hot chocolate, though as I grow older I find that for all its apparent simplicity, a really good cup can be hard to find. When I was a kid I drank Swiss Miss by the gallon and loved every tooth-aching drop, but as an adult I find powdered mixes just not up to scratch. I’ve also had limited success just combining good chocolate and milk. You certainly can, but it never turns out quite right – too little chocolate and the flavor is frustratingly subtle; too much and it’s just too rich to drink, an afternoon pick-me-up inadvertently becoming an early dinner. And then there’s the consistency. If you’ve ever been to Spain, you’ve probably tried hot chocolate there, which comes as thick as mud and is nearly always eaten like soup. As delicious as that is, if it’s not sippable it’s still not my quintessential cup. What makes the perfect cup, then? Well, it should carry a heavy hit of chocolate, preferably from both a high-quality bar and a good measure of cocoa for depth. It should be smooth, rich, and silky without the slightest bit of powdery grit. There should be just enough sweetness to take the edge off the bitter chocolate, but not nearly enough to be cloying. There should be a deep milky, creamy flavor without overpowering richness. It also should be quick to whip up, because hot chocolate is meant to satisfy spur-of-the-moment chocolate cravings. This recipe just might have it all. Its basis is a recipe in the highly acclaimed and encyclopedic Secrets of Baking by James Beard award-winner Sherry Yard. What tempted me first was the technique – she builds the recipe around a ganache, which is a brilliantly simple way to assure a complete emulsification and a velvety-smooth texture. Another point in its favor comes from the recipe making a large batch – perfect for storing in the fridge and reheating as the cravings strike. The other great thing about this recipe is that there are customizable elements – if you want it thicker and richer, omit the water and substitute cream for part of the milk. If you want it lighter, you can even dilute it more. The amount of sugar is also up to you – add a few tablespoons when you make it, or let yourself and your guests add it to taste to each steaming, luscious cup. Is this the perfect hot chocolate? You’ll have to be the judge of that. All I can tell you is that for the moment I’m not in a hurry for the warm weather to return. To make the ganache, chop the chocolate into small pieces and place in a heatproof bowl. Bring the cream and evaporated milk to a boil in a saucepan over medium heat. Immediately pour the boiling liquid over the chopped chocolate, then let it sit undisturbed for 1 minute. Stir slowly until everything is smooth and blended. Bring the whole milk and optional water to a boil over medium heat. Add the cocoa powder and whisk until dissolved. Remove from the heat and stir in the ganache. Let sit for 1 minute, then stir until well combined and velvety smooth. Stir in the vanilla, sweeten with sugar to taste and serve hot, garnished with a spoonful of lightly-sweetened whipped cream. Beautiful, Melissa! And how handy that a batch can sit in the fridge for a little while, so a cup is only a few seconds away. Advance planning in hot chocolate! Brilliant. You’re a girl after my own heart. Holy Cow that’s rich (and beautiful)…are you sure that’s legal? I’m also a sucker for hot chocolate, especially since I don’t drink coffee. I usually use a recipe I got from Scharffenberger, but I really want to try this one.And I love the idea of keeping it in the fridge. I’d like to keep a batch in my little fridge at work. Melissa,Reading a piece like this almost makes me wish I were a chocolate lover. Hot chocolate has been my constant compasion in my little stainless steel thermos lately. I’ve been steeping mine with a bit of cinnamon, enjoying the spicy heat against the cream … but how decadent and gorgeous yours looks, a MUST try, I’m sure. I absolutely adore the photo – it should be the emblem for chocolate fanatics everywhere. Hi Melissa, Spectacular photo with amazing staging, lighting, etc. Yours just keep getting better and better. I’m an admitted chocoholic, so the recipe caught me eye as well! Hello Darling! Your hot chocolate sounds delicious. I think I might be turning into a chocolate freak lately! Unfortunately the weather in Paris seems to not be able to make up its mind, cold one day, warm the next so my hot chocolate craving hasn’t entirely kicked in, but Im waiting for it! Lovely picture too by the way! Hi Melissa,I don’t drink hot chocolate too often, but this makes me want a cup NOW (and it’s 1 am here!). *sigh* I can just imagine the flavor and aroma…. Oh yes. THe dark perfection. A hint of bitterness, sweet on the tongue. Thicker than coffee. More satisfying than a single square on a rainy night. Hot chocolate makes me swwon, in the right moment. I may be approaching it soon, and now I know I have the beauty of this recipe calling for me. hi melissa, that is the very picture of cold-weather comfort. simply fabulous..isn’t sherry yard just the best? there’s a caramelised cinnamon hot chocolate recipe in p.h. that i really like – it also offers the all-important instant gratification you so rightly pointed out as necessary (make up a big batch, chill, and reheat as craved).. strangely enough, i was weaned on swiss miss as a kid too! Ooh, I’ve got friends coming over this weekend. I think I’ll make this for them – it’ll blow their minds. Oh man! This picture! Perfect, what can I say.I am not a chocolate-lover at all, but this made me think twice. Hi Sam – Thank you, that’s the atmospheric Scottish drizzle for ya!Hi Christine – Hopefully this will fit the bill! Just don’t be afraid to adjust the various elements to taste – that’s what I love about this recipe.Hi Clare – I too would never say no to any form of chocolate beverage, but sometimes it’s nice to go a little over the top, wouldn’t you agree?Molly dear, we are two of a kind. I firmly believe there should be as little effort standing between one and one’s daily fix of chocolate as possible!David, thank you. But your question is better left unasked – do we really want to know the answer..? Hi Sheri – I’ve been tempted to take a batch into work with me as well. The only thing that stops me is the thought that I may have to share… ;)Hi Paz – I’m sure the temperature will be dropping soon enough. And when it does, you know what to make!Hi Kevin – You know, it’s never too late… :)Hi Fanny – We seem to share a mind recently! I’m glad I was able to help satisfy your hot chocolate cravings too – I wonder what we’ll both think of next?Hi Tara – Thank you! I love the idea of steeping spices in the hot chocolate, I think that’s the next step in the evolution of this recipe. By the way, I’m on the edge of my seat for that arborio rice pudding recipe!Hi Chefdoc – Thank you! !Michele, believe me, there are worse kinds of freaks to be! And enjoy the warm weather while you’ve got it – soon enough, you’ll be freezing with the rest of us, and there’ll be plenty of cups of hot chocolate waiting to be inhaled!Hi Reid – I have to admit, as much as I imagine I would love to live in Hawaii, it would be a bit frustrating never having hot chocolate-drinking weather! Hmm, but I suppose there’s nothing saying you have to drink this hot – there’s iced coffee, so why not iced chocolate?Shauna, you obviously know the craving well. 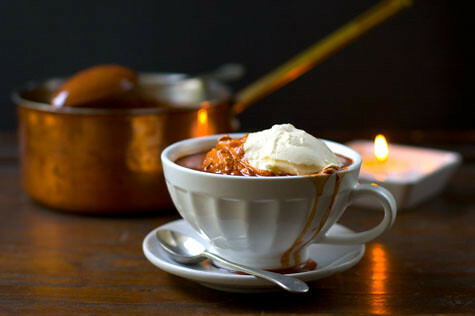 A need for chocolate coupled with a need for something hot, filling and soothing – there’s nothing better, whether the rain outside is Scottish or Northwestern!Hi J – I just got the Sherry Yard book, and it fabulous. Definitely one of the best dessert books out there. I’ll have to try P.H.’s hot chocolate as well – you didn’t think I just got one new book, did you? 😉 And surprising how a childhood predilection for swiss miss seems to turn out fine-chocolate fanatics! Makes me wonder what will happen to our kids if we raise them on hot chocolate like this…Hi tscd – If they’re chocolate lovers, it certainly will! Just make sure they’re not on a diet first ;)Hi Fethiye – Thank you! Maybe it is time to think twice – there’s a lot of chocolate lovers (addicts?) around here who I’m sure would be happy to convince you how green the grass is on this side…!Hi Nicky – That hot chocolate sounds lovely, though I know what you mean about heavy duty! Luckily it gets cold enough in Germany to really justify the heavy duty stuff – that was one of the only consolations I had to get me through the long icy winters there. And welcome back, by the way, your trip looks like it was amazing! Wow, hot chocolate’s been on my mind lately, too. I haven’t made any yet, as we’re finally getting our few weeks of warm weather in San Francisco. But when the craving strikes, I know where to look. Hi Melissa,what a lovely post on hot chocolate! I remember cravings for hot chocolate during winter at University….anytime of the day, it’s my quick sugar fix! Beautiful picture as well! Malka, yes, I always use American-standard cup measures which are 250ml. Good luck! Hey Melissa…congratulations on the DMBLGIT win…again! I’m crowing a little because I called all three top winners (in emails or comments to their authors before the judging). At least I know a good photo when I see one! Anyway, as usual, a beautiful photo. So, is your life as beautiful as it appears on your blog? Congratulations on the win in DMBLGIT. Your photo was truly beautiful. well, I made this recipe a couple of months ago, and I have to say it’s AMAZING.rich, deep, strong…Most exquisite with just a dash of creme fraiche, and a sprinkle of cayenne powder on top.by the way, I recieved half a package of chilli-flavored bittersweet chocolate, that comes in a red foil package and the paper wrapping around the foil is orange and shows a chilli pepper on it. The pepper really comes through and compliments the cocoa flavor, and the heat kicks the sweetnes up the arse. have you tried it?I’m thinking of adding a couple of cubes to the next batch. Hi Melissa, have been dying to try this out and went all around town looking for evaporated milk. It doesn’t exist here in Germany. Can I substitute condensed milk or cream? In the meantime, while waiting, I shall try it with these substitutes anyway. Hi Fran – Sometimes it helps having a German husband! He says evaporated milk is called Kondensmilch in German, and it’s available everywhere. Hope you’re able to find some! Oh thanks. I just did a search before reading your reply and it seems, he is right. I did see Kondensmilch at the supermarket but I thought it was Condense Milk. Yes, it is certainly is the Perfect Hot Chocolate. Thanks for sharing. I’m late to the party, but that is a beautiful photo! I love eating chocolate–especially dark chocolate. Never really thought to make my own hot chocolate though, nice post! Winter’s coming I’l be sure to try this.